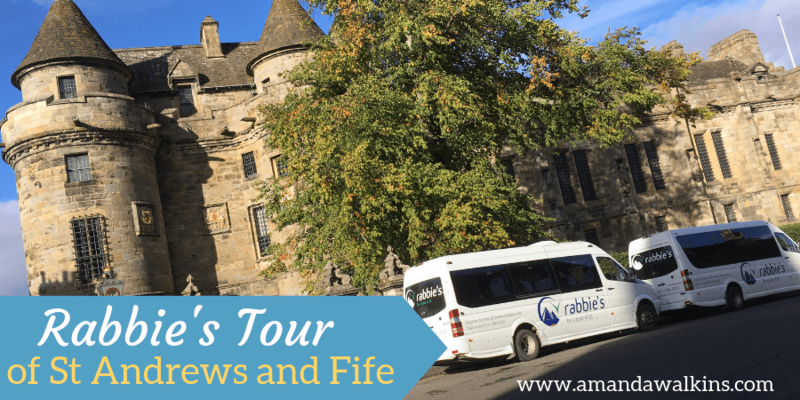 Rabbie’s offers tours in Scotland, England, Wales, and Ireland. They also just added a new option to cover even more ground by integrating trains into their tours between England and Scotland. Now, you can start a tour in London and still see much of my beautiful adopted home! I haven’t done one yet, but I sincerely love the concept. We opted for the St Andrews and Fife Rabbie’s tour for several reasons. First, my dad is an avid golfer and St Andrews is a beloved destination for any fan of the sport. Second, the St Andrews and Fife tour is not a monstrously long day, which some of the highlands or west coast tours can be. Since St Andrews itself is just an hour drive from Edinburgh, adding in a few leisurely stops en route still doesn’t make for a crazy day. I’ve done the day tours when you board around dawn and return after dark. You see so much and they can be amazing! But you also feel utterly exhausted by the end of the day and the next day is not an easy one for doing lots of activity. Since much of my family had visited Edinburgh before, we could take it easy enough and enjoy the city. But getting out and seeing somewhere new was a highlight on the itinerary! All Edinburgh-based Rabbie’s tours leave from their main office near Waverley train station. This is super convenient no matter where you’re staying around Edinburgh. We lived on the other side of the city and it still only took us about 15 minutes door-to-door. If you stay outside of town, hop a bus or train and they mostly all drop right at Waverley Station. The Rabbie’s office is just a block away from there, heading towards Calton Hill. Rabbie’s offers a wide variety of tours on any given day, but they are also a well-oiled machine. Make sure you arrive a minimum of 15 minutes before tour departure so you can check in and be ready to board your bus. There will likely be several tours leaving around the same time, so don’t risk showing up late and delaying everyone! There is a cafe at the office so you can also enjoy a coffee before you hit the road. Given the early departure times of many of these tours, that caffeine is most welcome! Instead, these tour buses offer familiarity and a closeness with your tour guide and with your fellow passengers. You’ll be spending all day together, so go ahead and say hello! If you’re lucky, your bus will even be led by Kevin the Coo. He has some fans on social media and was our mascot for the day of our tour! How lucky were we?? Overall, Rabbie’s comfortable seats, USB outlets, and professional tour guides make for a fabulous day out. Note that, because this is not a coach bus, there are no bathrooms on board. Stops are planned frequently though, so you are rarely on board for so long as to feel uncomfortable. The St Andrews and Fife Rabbie’s tour leaves from their main office in Edinburgh in the morning and heads first to South Queensferry, which is a favorite stop of mine. This town overlooks the Forth of Firth toward the Kingdom of Fife beyond. There are three bridges launching from this area: The Forth Rail Bridge and two road bridges. The Forth Rail Bridge is a UNESCO World Heritage Site and a true beauty. It bears a similarity to the Golden Gate Bridge, albeit on a dramatically smaller scale. It is beautiful to look at from afar and also lovely to cross by train. The other two bridges are road bridges, with the newest one having just been completed in 2017. From further inland, you can see all three bridges spanning the water and rising above the low hills of the Lothians. I love catching those quick peeks from the train into Edinburgh from West Lothian. The new road bridge looks like a 3-masted ship setting sail. The combination of historic and modern architecture is stunning. From South Queensferry, you can stand under the bridges and admire their beauty up close. The town is also super cute to drive through, with its cobblestone streets and narrow lanes lined with stone houses. You’ll get to enjoy this en route to the road bridge itself. Once over in the Kingdom of Fife, you’ll hop along the coastal route, which is a much smaller road but allows for you to hug the sea. There, you’ll stop into Anstruther, a small fishing village that’s been a popular spot for centuries. Grab a coffee or a pint, whichever you fancy. Check out the boats in the small harbor and step out onto the small local beach before boarding the bus again for the lovely drive to St Andrews. The town is famous for golf and for its eponymous university, which has educated many a famous royal, politician, and more. The ruins of the old St Andrews Cathedral overlooking the sea are also impressive, as are the beaches and dunes by the Old Course. The town is quaint but offers enough options for you to find any lunch that suits your tastes. You’ll have plenty of time to do so with a few hours in St Andrews. You’ll also find plenty of good shopping opportunities to snag a souvenir. Or just stroll the beach, explore the ruins, and – of course – admire that popular golf course. After your lunch and wandering around St Andrews, you’ll hop back onto the bus to circle back toward Edinburgh. A final stop in the village of Falkland offers Outlander fans a chance to visit a filming location. This town stood in place of old Inverness in the first season. Not a fan? No worries, you can wander the small streets or explore Falkland Palace instead. And, of course, take the time for another pint with your dad! Even though we have our own car now, there are still trips that are better made with a tour guide (or a designated driver!). While we can use Google maps to drive around every backroad, we won’t get a running commentary about the history en route. We can drive to the historic sites, but we won’t get the funny little stories that a professional guide can offer in addition to the important facts and figures. I am a huge proponent of tourism professionals (thus my involvement in Travel Massive everywhere I go!). No matter how much information we can gather online, it cannot be delivered in the same entertaining ways as a professional storyteller and history lover can do. And – while I’m enormously grateful for it – public transportation just isn’t the same. We’re still not really paying attention to what we pass en route, while a tour guide would point out that little spot or pull over at this special view. I choose to take tours run by reputable operators. I also prefer small groups so I don’t feel like cattle and I don’t worry that we are causing harm everywhere we go. Large buses cannot possibly be environmentally friendly and I know they are not road-friendly! Let’s face it: We are also not good when in large groups. We follow the masses, we do things we otherwise wouldn’t do because we aren’t thinking as individuals or making decisions based on our surroundings. Instead, we play follow-the-leader and lose all sense of individuality. I’ve seen it too often to condone it here! Small groups, private tours, or going solo are pretty much the only options I see as viable. I choose to go with Rabbie’s tours because they fit within my ethos while still being affordable and personable. I adored our guide, Gill, so much that I started following her on Instagram right away! She posts regular photos from her tours and it keeps me wanting to see more of this beautiful country. I have also met other Rabbie’s employees and I know other bloggers they’ve worked with. The company is good. The people are good. The tours are good. I like to support companies that do good and I hope you do, too! Feel free to contact me if you have any questions about Rabbie’s tours or about visiting Scotland in general! We’ve lived here on-and-off since 2015, so I have loads of tips to offer.